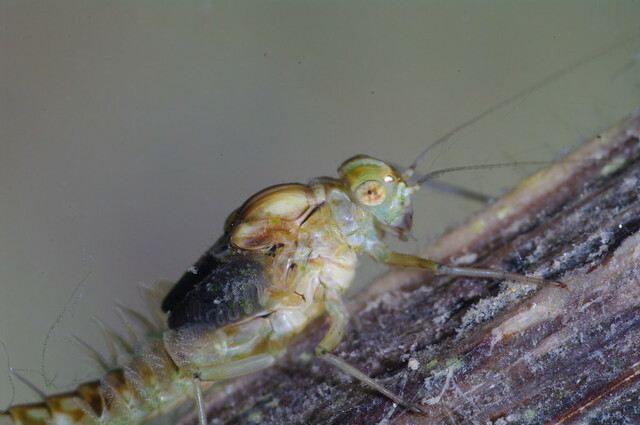 This species is a bit of a pond and pool specialist (although it can be found in rivers), but due to predation it prefers those without fish (Nagell, 1980). It feeds by scraping algae off stones and plants and sifting through sediment for organic matter. When the surface of a pond freezes in winter, the water in it can become completely anoxic (hold no oxygen). In Sweden it was noticed that Cloen dipterum was common in those ponds that became anoxic in winter, often for 3 or 4 months! Work by B. Nagell has shown that the species has adaptations to survive in these oxygen poor conditions when the water temperature is at 0ºC. They are also tolerant of the build up of Hydrogen sulphide and when they can not obtain oxygen they can survive for 6 weeks without any adverse effects (Nagell, 1979). In experiments (Nagell, 1977) “about 50% of larvae survived 130 days of anoxia at 0°C; the most resistant surviving 155days.” It is believed they do this by using anaerobic respiration (Nagell, 1980), which is put (over) simply involves using sugar (glucose) instead of oxygen to respire. They are believed to store up a supply of glucose during autumn. They have another trick up their sleeve too (well they would if they had sleeves…). When ice forms on the surface, the mayfly larvae can be seen clinging to the underside of the ice (Nagell, 1979). This is because the water just below the ice is often richer in oxygen, particularly if the ice has cracked and/or started to melt, which allows them to breathe in the otherwise oxygen depleted water. But the oddness (for mayflies) doesn’t end there. 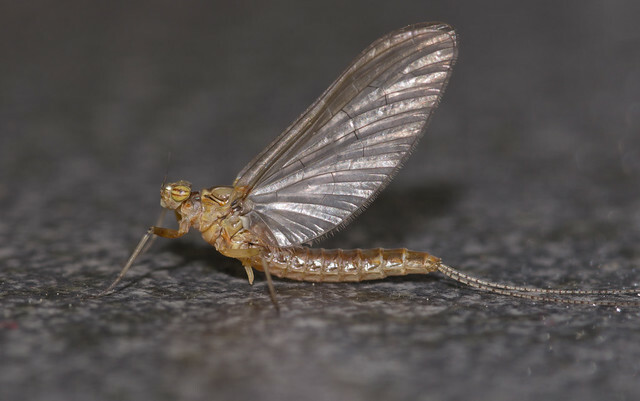 Like all mayflies when the larvae are fully grown, and conditions above the surface are right, they swim to the surface and emerge as (unlike all other insects) sub-adults, before flying of and moulting into adults. But rather than mate, lay eggs and die like most species, the female pond olive flies off and rests for 2 weeks. Then when she finally lays her eggs they hatch straight away and the nymphs swim off (Macadam and Bennett 2010). Nagell, B. 1977. Survival of Cloeon dipterum (Ephemeroptera) larvae under anoxicconditions in winter. Oikos 29: 161-165. Nagell, B. 1980. Overwintering strategy of Cloeon dipterum (L.) larvae. Pages 259-264 in Flannigan JF; Marshall KE. 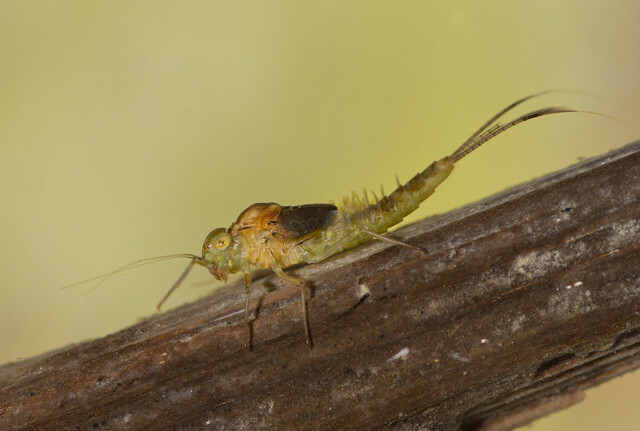 Advances in Ephemeroptera Biology. Plenum Press, New York.